Mennonite Peace & Justice - BloNo | Writings and sharings from the Peace and Justice Committee of the Mennonite Church of Normal, IL. The author at least hints at actual alternatives to predatory lending such as payday loans, rigid bank credit standards for lending, etc. Issues of justice (or injustice) which create poverty are sometimes tiny but powerful. This article helped illustrate some of these problems. A valuable bonus in the article is the embedded link found at the end, a 40 minute mini-documentary entitled “Spent: Looking for Change”. Here’s an ‘appetizer’ from this documentary (and article) which might pique your interest in viewing the entire piece. “Turning to pawn shops, check cashing services, and using payday loans to meet basic financial needs can be costly for many of us, with $89 billion a year going to fees and interest for using these types of alternative financial services,” they write. Unbanked families spend 10 percent of their money replacing traditional banking services. That’s as much as most families spend on food. Forwarded from our friends at Illinois People Action. http://www.dnr.illinois.gov/OilandGas/Pages/OnlineCommentSubmittalForm.aspx Fill out the information required, click on the Section B radial button and then submit the comments we have attached (or write your own). Make sure if you submit your own comments on a different section of the rules that you click the correct radial button associated with the section of the rules you are addressing. NOTE: New Yorkers sent in 200,000 comments on their proposed rules. There were so many, it put a cog in the wheel. We want EVERYONE receiving this email to to make comments. Now is when the rubber meets the road. We told IDNR and our legislators that the public is not happy about the weak regulations. We need to act now and demonstrate we are not going away! 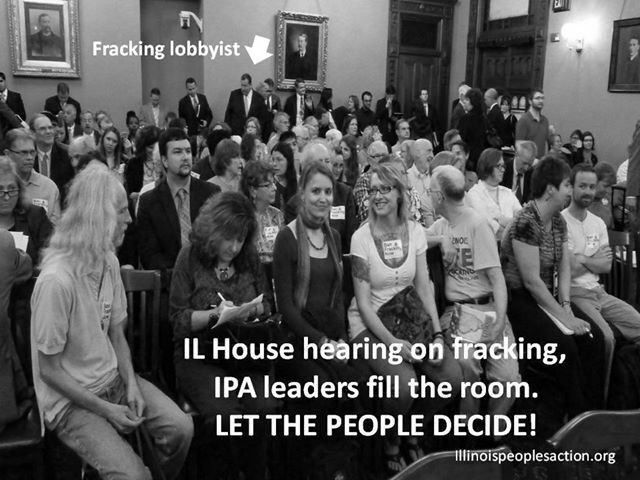 Please stay tuned to upcoming emails from IPA and be ready to take action! Jeffrey Kovac, Refusing War, Affirming Peace: A History of Civilian Public Service Camp No. 21 at Cascade Locks. Corvallis, OR, Oregon State University Press, 2009. ISBN 978-0-87071-575-4. Some 12,000 men served as conscientious objectors during World War II. For religious/and or philosophical reasons they refused to be part of the American military machine. Proportionally, that number was relatively small as compared to the total number of British conscientious objectors. Among the 12,000 were 4,665 Mennonites. During the First World War conscientious objectors were often brutally treated. It was only in 1918 that many were allowed to do farm work. During the Second World War they were permitted to perform civilian work of “national importance.” They were housed in 151 so-called Civilian Public Service (CPS) Camps, that had once been used by the New Deal’s Civilian Conservation Corps (CCC) in the 1930s. Most of the CPS camps were run, financed, and organized by the three so-called Historic Peace Churches: Church of the Brethren, Quakers, and Mennonites. Sixty-three of the camps were run by the Mennonite Central Committee. The story of World War II conscientious objectors has been told, but little has been written about individual CPS camps. This reviewer can think of only one other study of a CPS camp: Gordon Zahn’s Another Side of War: The Camp Simon Story. * However, this is only an account of a short-lived and failed Roman Catholic camp. The story of Cascade Locks, Camp #21, is the most complete of any CPS camp. It is written by the son-in-law of one of the CPS’ers in the camp, Charles Davis, and is based on a great variety of sources, interviews, diaries, the camp’s newspaper, The Columbian, etc. The men in CPS camps performed a variety of tasks many of which were related to forestry, soil conservation, etc. Later many were permitted to work as “smoke jumpers,” ward attendants in mental or regular hospitals, and serve as “guinea pigs” for medical and dietary experiments. CPS Camp #21 at Cascade Locks, OR, was located near the Columbia River about twenty miles northeast Portland. The name Cascade Locks is derived from the locks in the Cascade Rapids of the Columbia River. The camp itself was actually located in Wyeth about eight miles east of Cascade Locks. A small side camp was established on nearby Larch Mountain to place a crew closer to areas of potential forest fires. The location of Cascade Locks had been chosen because of its easy access to roads and rail and offered a variety of U.S. Forest Service Projects in Mount Hood National Forest. From a scenic standpoint the camp was a spectacular site, but it also received a large amount of rain and had very cold winters. Cascade Locks was started on November 27,1941, and closed in June 1946. An average of some 200 men stayed in the camp and a total of at least 560 spent some time there making it the largest CPS camp. *Amherst, MA: The University of Massachusetts Press, 1979. The camp consisted of four dormitories, a dining hall, an infirmary, a laundry and latrines. The men turned one of the buildings into a library and renovated the old CCC chapel. Initially, Cascade Locks was administered jointly by the Brethren Service Committee and Mennonite Central Committee. This joint sponsorship soon proved to be unsatisfactory , and in May 1942 it became a Brethren camp. Some forty-seven Mennonites did serve in the camp at one time or other in addition to many other denominations. Among the latter were, of course, many Brethren and Methodists, some Quakers, a few Jews, and one Moslem. Until February 1944 Brethren Rev. Mark Schrock served as the camp’s director. The author has much praise for his very able leadership and shows how much the men appreciated his important contributions. It was Schrock who placed his personal collection of some 2,000 books in the camp library. Unfortunately, the library and all the books were lost in a fire in February 1943. After his resignation a committee assumed leadership of the camp. Few CPS camps had many able and committed pacifists many of whom had lively and varied interests. Like most CPS camps, Cascade Locks had its own newspaper the The Columbian but also a literary magazine, The Illiterati . The men also showed much interest in thespian activities and engaged in book discussions. Furthermore, they organized, what they called, the School of Pacifist Living. Among its most famous residents was the well-known actor Lewis [Lew] Ayers who had starred in the famous 1930 film “All Quiet on the Western Front. But Ayers did not stay very long. He preferred to serve a non-combatant medic and left in May 1942. Another resident at Camp 21 who drew much attention was George Kiyoshi Yamada. Yamada was of Japanese ancestry and arrived at Camp 21 in December 1941. However, like all Japanese living along the west coast, he was instructed to leave Cascade Locks to go to a War Relocation Camp for Japanese internees. Director Schrock and the men in camp as well as other CPS camps protested against the transfer. As result Yamada was transferred to a CPS camp in Colorado Springs, CO. The men of Camp 21 also protested in 1942 when they were asked to build logging roads for a new camp called Three Lynx. The men, led by Schrock, concluded that this project was in some way war-related. Their protests were successful and the U.S. Forest Service agreed to drop the project. Not everyone in Cascade Locks and other camps was content. The men were often bored because the work offered few challenges. Also their meager pay of $2.50 per month, caused financial hardship for their families. Others were disillusioned with CPS. A number of men at Cascade Locks but also in other camps walked out. These men were arrested and sentenced. One person at Cascade Locks decided to join the army most likely for financial reasons. The same happened in other CPS camps. The author concludes that CPS Cascade Locks created a community where justice was a guiding principle, the arts and learning flourished, and individual differences respected. Perhaps to some extend the same can be said about many other CPS camps. They were avenues of peace. Refusing War, Affirming Peace may inspire you to become a peacemaker and strengthen your Mennonite peace commitment. Click here to see a pdf version of this letter. We greet you today in the name of our Lord Jesus Christ. Today we lament the horrendous and inhumane atrocities – reports of which fill our newspapers and dominate our television screens – as the world is again rightfully concerned about actual violence in Syria and a potentially expanded conflict. As he [Jesus] came near and saw the city, he wept over it, saying, “If you, even you, had only recognized on this day the things that make for peace! But now they are hidden from your eyes” (Luke 19:41-42). It is not difficult to imagine Jesus still weeping today: over Damascus, Washington, D.C., Moscow, Paris, London, Jerusalem, Cairo, New York, Beijing, and many other places. The world is not the way it was meant to be. At Jesus’ birth the angels proclaim “peace on earth” (Luke 2:14). Through him God hoped to “reconcile the world,” calling the church to be God’s co-workers in the ministry of reconciliation (II Corinthians 5:18-19). The Body of Christ weeps with Jesus today. We weep not only for Syria, but also for other situations affecting our brothers and sisters: the poisoning of crops and water supply in the Choco, Colombia; the land stolen by huge multi-national corporations in Panama; the historic and ongoing strife and war in Congo; the alienation and suffering in Egypt; and the millions of refugees displaced by human strife. We weep because the dominant patterns of confronting violence, protecting the vulnerable, and working for peace continue to be strategies of increased militarization, trust in revenge, and confidence in punishment. Our world continues to hope for peace by preparing for war. The weeping Jesus chose a different path. He decided to trust in God’s sovereignty over the nations. He affirms the prophet Isaiah’s conviction that: “The nations roar like the roaring of many waters, but God will rebuke them…” (Isaiah 17:13). Above all, Jesus chooses suffering love to the point of death on the cross, rather than military options of terror, revolution, or the protection of national self-interest. God transforms this suffering love into Gospel. Through the power of the resurrection, God converts the weapon of Roman state-terror (the cross) into the “power of God to save” (I Corinthians 1:18). For where there is envy and selfish ambition, there will also be disorder and wickedness of every kind. But the wisdom from above is first pure, then peaceable, gentle, willing to yield, full of mercy and good fruits, without a trace of partiality or hypocrisy. And a harvest of justice is sown in peace for those who make peace (James 3:16-18). 1) Praying: Pray for all those who understand themselves and others as enemies. Pray for each other as sisters and brothers in Christ – in our Communion and beyond – as we seek to live out our vocation of suffering love amid the roar of the nations. (Please note that the World Council of Churches has also designated September 21 as the “International Day of Prayer for Peace” http://www.oikoumene.org/en/press-centre/events/international-day-of-prayer-for-peace). 3) Witnessing: Please feel free to pass on this letter, as appropriate, to others: family, friends, other Christians, other denominations, government leaders, and media outlets. 4) Sharing: Please go to http://www.mwc-cmm.org/article/peace-syria, https://www.facebook.com/MennoniteWorldConference or email to rjsuderman@mwc-cmm.org and share actions of worship, prayers, and witness that you have done or are planning to do. This will be a source of encouragement and inspiration for others to become involved. The grace of the Lord Jesus Christ, the love of God, and the communion of the Holy Spirit be with all of you (II Corinthians 13:14). Background: The U.S. government appears to be preparing for a military attack against Syria, in response to last week’s alleged chemical weapons attack in the suburbs of Damascus. 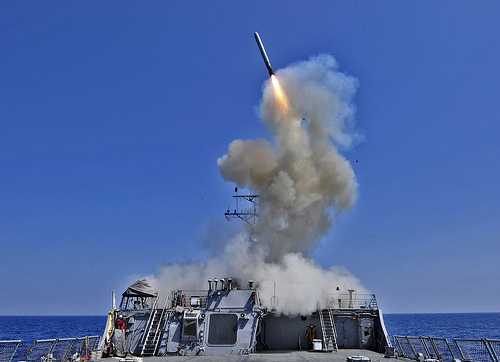 U.S. missile strikes could well lead the U.S. into an ever-deepening military conflict and will certainly cause even more suffering for the people of Syria who have already suffered so much. The MCC representative for Syria and Lebanon reports on her numerous conversations with Syrians in the last few days: “Without fail they are all saying the same thing. ‘We are all very worried. We hope the U.S. won’t do anything.’” Read MCC’s call to end the violence. While allegations of chemical weapons attacks are extremely serious, the U.S. and others in the international community must allow U.N. investigations to proceed to determine the facts of what happened, and then respond through appropriate diplomatic and legal channels, not militarily. It is urgent that Members of Congress hear today that their constituents are opposed to U.S. military action in Syria, including U.S. missile strikes and sending weapons to opposition groups. Faith reflection: Hate cannot drive out hate; only love can do that. — Martin Luther King, Jr.
Action: Please call or email your Members of Congress today, urging them to oppose U.S. military action against Syria. The Capitol switchboard is (202) 224-3121. Alert prepared August 29, 2013 by Rachelle Lyndaker Schlabach, director, rals@mcc.org. The experience of other states with fracking is worth considering. In Pennsylvania, Texas, and Wyoming, people have been forced from their homes because their water became undrinkable (flammable, in some cases). Families have become ill, property values have plummeted, and precious woodland, farmland, and ranchland have been sacrificed to drilling rigs and pipelines. Right now there is a glut of natural gas, so there is no compelling need for fracking to begin in Illinois. As for the much-touted jobs, Bureau of Labor Statistics data show, not the 125 jobs per well which the industry promises, but instead 1.7 jobs per well. Last summer we learned how precious ample, clean water is. If you would prefer that we not risk this irreplaceable resource, please ask your representatives to vote for a moratorium on fracking in Illinois: HB 3086 and SB 1418. Thank you for caring! Why have so many Mexican corn farmers left their farms (and come to the US)? In her article Far from Home in the May 2010 MCC Women’s Report, Linda Gehman Peachey reminds us that many notable persons in the Biblical narrative were forced to leave their homes in search of food. Among them were Abram and Sarai, and later Jacob and his family, who went to Egypt during a time of famine at home. Elimilech and Naomi and their two sons went to Moab to search for food also. The majority of Mexican farmers affected by NAFA were traditional corn farmers. After NAFTA took effect in 1994, these farmers were no longer eligible for Mexican government subsidies. Additionally, they were now required to compete in the marketplace with heavily-subsidized U.S. and Canadian agribusiness products. Between 1995 and 2006, U.S. government subsidies to American agribusiness for corn production ranged from $1.8 billion in 1996 to $9.3 billion in 2005. “For the farmers who managed to hold on, monthly income fell from about 2000 pesos a month in 1991, to 230 pesos in 2003. Meanwhile, food prices increased nearly 600 percent from 1994-2000. It should not be surprising, therefore, that the number of Mexicans migrating to the U.S. increased dramatically since NAFTA came into force in 1994. Two-thirds of undocumented Mexicans currently in the U.S. have come since 1994” (Peachey). In public debates over illegal immigration, one hears very little about the U.S. trade and agricultural policies which have driven millions of Mexican corn farmers off their land. Perhaps if these policies were more widely known Americans would have a different perspective on the many issues surrounding illegal immigration.